The blackness of night was just start starting to yield to the deep blue horizon in the east. Our wildlife tracker, Enoch, had pounded on the pole of our tree camp platform calling us from slumber. It was early autumn in the Klaserie Private Nature Reserve bordering South Africa’s Kruger National Park and the wind blew cold through our chalet at the nThambo Tree Camp. We knew it would warm up during the day, but the first morning safari would be cold. As we dressed, we could hear a giggling hyena way off in the distance. And so began a typical day on safari. Just after 5:00am, we stumbled out of chalet #2 and boarded the open-top Land Rover for our morning game drive. The trackers had already been out in the blackness. Just up the road from the camp fresh elephant tracks had been spotted. Our guide Matt eased the Land Rover out onto the dirt two-track north of the camp. Our very first sighting came quickly that morning. 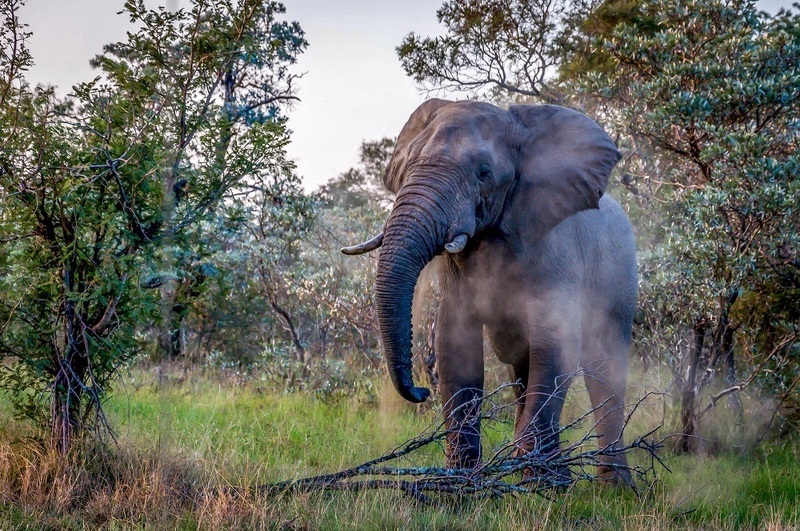 Not far from the camp, we rounded the bend in the road and stopped just short of a large bull elephant. His ears perked at our presence, but he continued ravishing a small tree and didn’t pay us any attention. After spending 20 minutes watching the elephant make short work of the tree, we moved on and quickly came on three square-lipped rhinoceros (sometimes called white rhinos) in a small clearing. Looking back as we were planning our safari, the rhinos were the animal I was most excited to see. 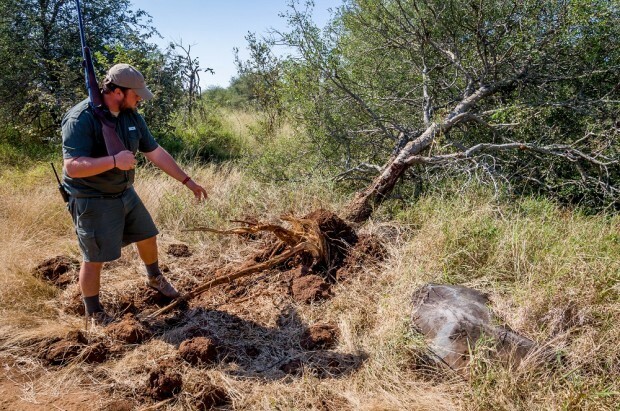 We had read a fair amount about rhino poaching before coming over to South Africa, but our guide from nThambo explained the rhino conversation efforts in the Klaserie Private Nature Reserve. Frankly, it was sad to think these magnificent animals are being slaughtered so some guy in Asia can try to keep an erection. 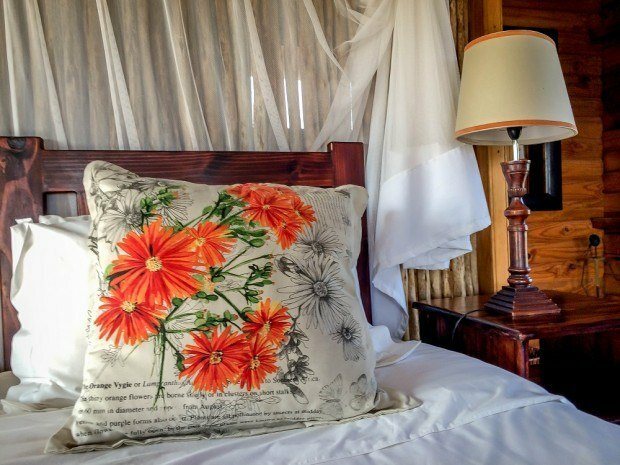 We rumbled our way back to the nThambo lodge in our humming Land Rover and bumped our way over the rough dirt track roads. 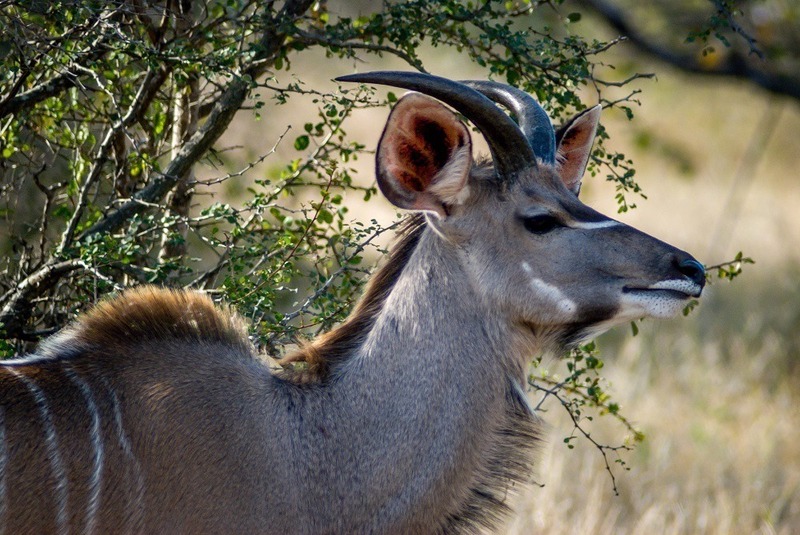 Along the route, we slowed for sightings of numerous impala herds and several long-necked kudu pairs. The prey was out in the Klaserie. We had high hopes of seeing some apex predators in the evening. 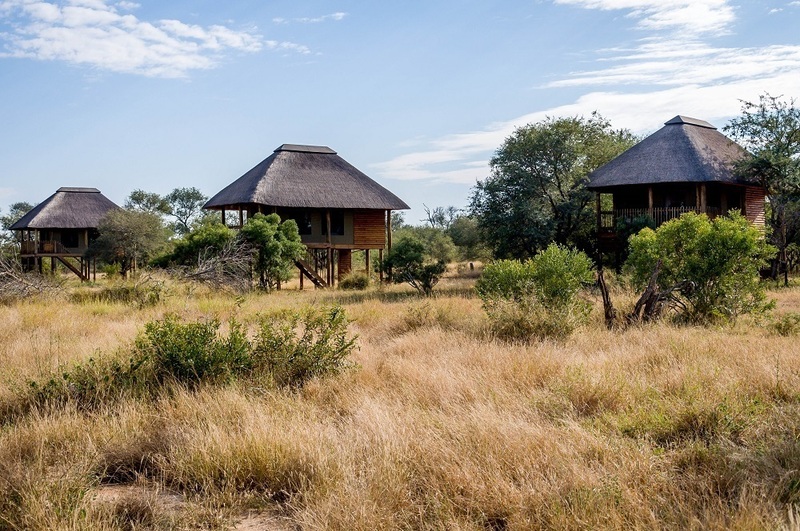 Like other safari lodges, at nThambo Tree Camp, the day is marked by game drives at sunrise and sunset. Between them, breakfast and lunch are served. 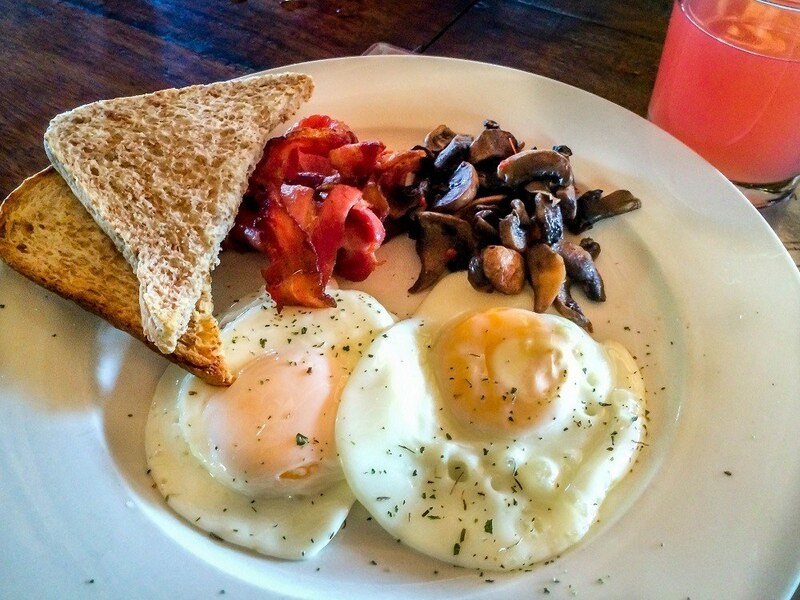 Breakfast is a multi-course affair with fresh breads, fruit with yogurt, and followed by eggs cooked to order and the meat-of-the-day (typically bacon). Lunch was either Mexican-inspired lasagna or chicken wraps served with copious amounts of salad. 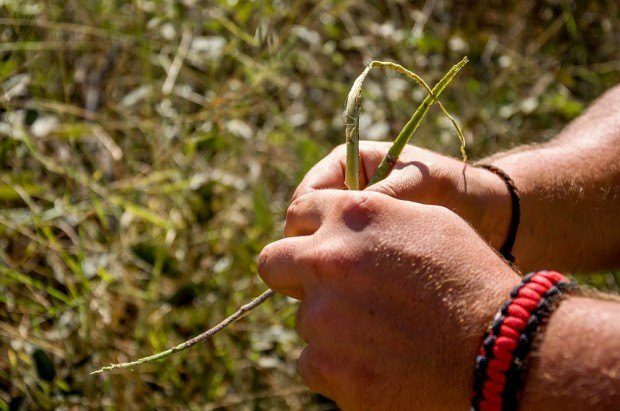 The time between breakfast and lunch gave us ample opportunity for a long bush walk. 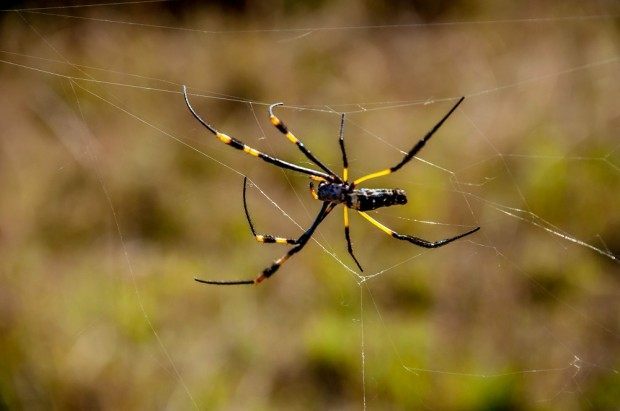 This was a chance to look at some of the smaller plants and animals of the bush, including birds, giant spiders and unique vegetation. We did see one hippo in a small bush pond from a distance, but our guide didn’t feel comfortable approaching any closer due to the unpredictably of these giant animals. On our second day, the breakfast-lunch break turned into total relaxation. For us, that meant reading a book by the plunge pool and taking a nice little nap in our chalet. We would have gone on another bush walk on the second day, but we knew we would be doing walking safaris the next few days at nThambo’s sister camp, Africa on Foot. 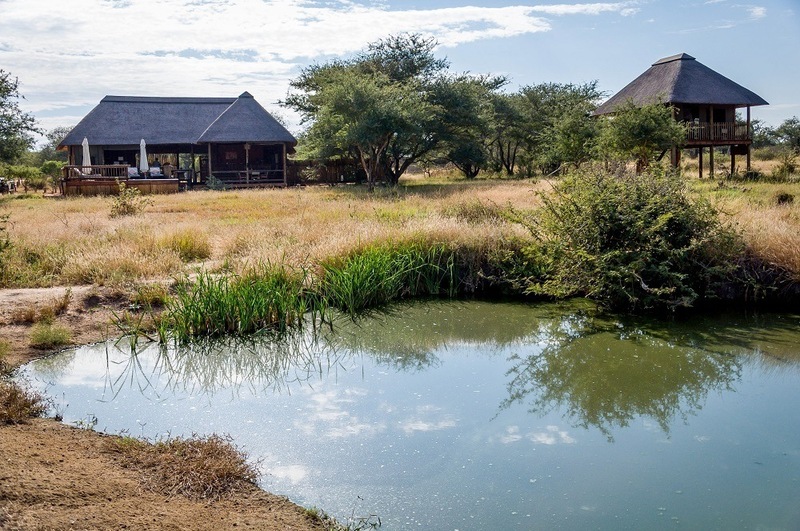 Just before 4:00pm, we began gathering in the main lodge for our evening safari. There was an excitement in the air. 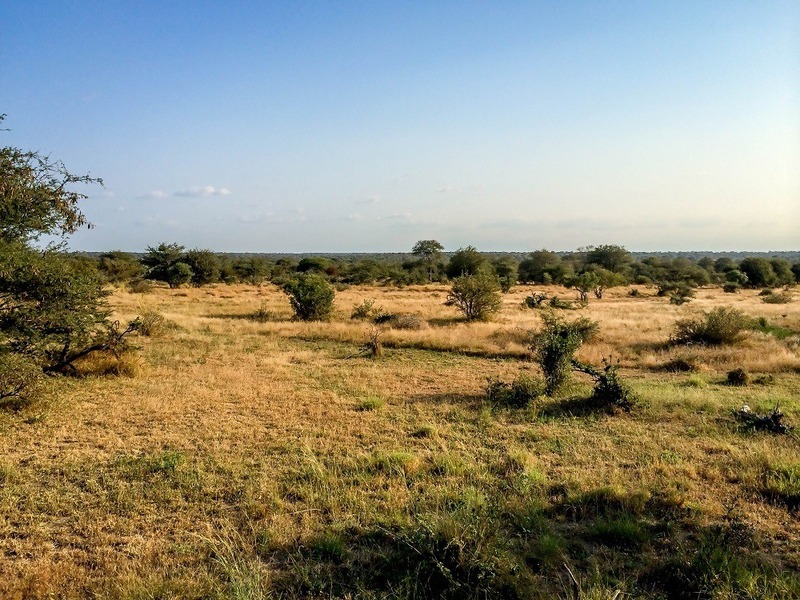 Several of us wondered if the large numbers of impala would bring in some of the big predators. Our guides were tight-lipped on the plan for the evening drive, casting broad toothy smiles our way when we asked about the plan. Our guide Matt, steered the Land Rover to the south, moving with purpose. One ridge to the south, he paused and our tracker Enoch got out looking at the fresh prints in the sand. He jumped back into the tracker seat and Matt steered the Land Rover off the dirt two-track and into the bush. Trees and bushes scraped the side of the vehicle as entered a dense thicket. 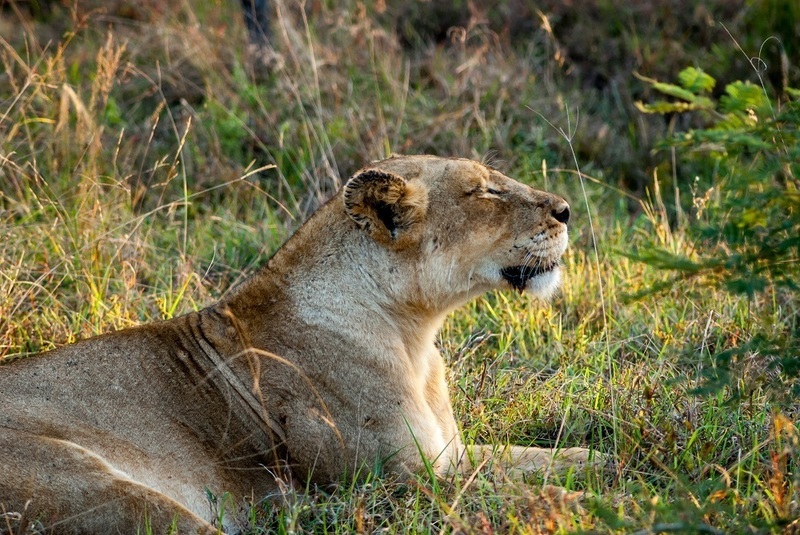 Under two small trees were two giant lionesses of the Ross Pride sprawled on the grasses relaxing. One of the females had recently birthed cubs and was still lactating. We were able to get right up to them as they cat napped and lounged in the sun before they went hunting. We spent almost 45 minutes with these lovely ladies! 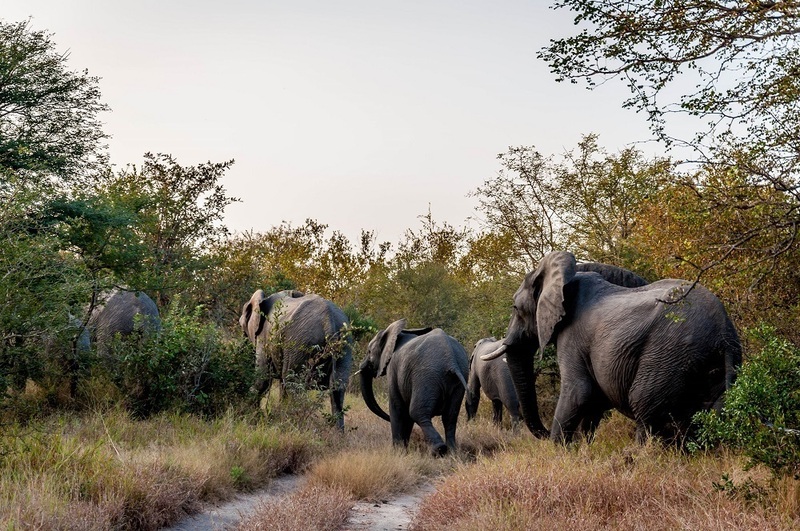 After leaving the lions, we came upon a whole herd of elephants. They had the markings of Kruger National Park, had traveled through the Timbavati Game Reserve and were heading west. There must have been 20-30 elephants in the herd. While they weren’t fearful of us, they definitely kept a distance. Two young calves in the group may have been the reason for this. On all safaris, just before dark, guests stop for a snack and cocktails, called a “sundowner.” Some game lodges make this a formal affair with white tablecloths and waiters. nThambo takes a minimalist approach – self-serve snacks and delicious wines from South Africa’s Creation Winery served in real stemware. This is really just a break to stretch the legs, so what else do you really need? We loved our sundowners! The remainder of the game drive after sundown and into the darkness of night involved using a searchlight to illuminate the eyes of nocturnal animals: wild dogs, porcupines, and others. But the darkness of night also brought the cold, so we were thankful we dressed warm. 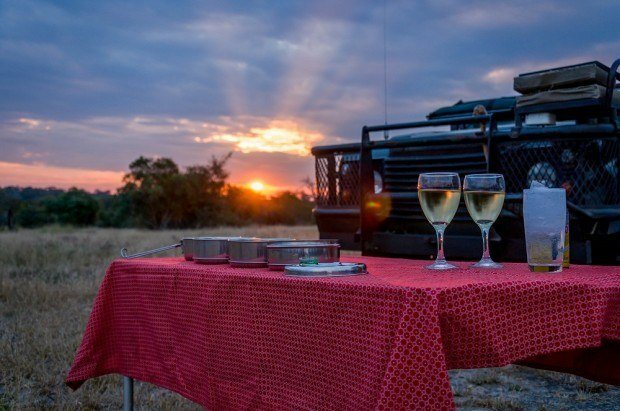 After the sunset game drives, we would gather with other guest for dinner on the broad communal table. Dinner was formal, but not stuffy. There are no white tablecloths at nThambo, only rich natural woods and a placemat of African tribal patterns. The food was delicious – either a beef filet or lamb’s neck with rice. I know what you’re thinking with lamb’s neck, but it really was divine! As with all meals, a massive bowl of salad and a delicious dessert accompanied the meal. The evenings on safari are quiet. There’s no TV to offer mindless entertainment. After dinner, we would stay in the lodge for a little while talking to other guests. One by one, couples would be escorted back to their chalets. 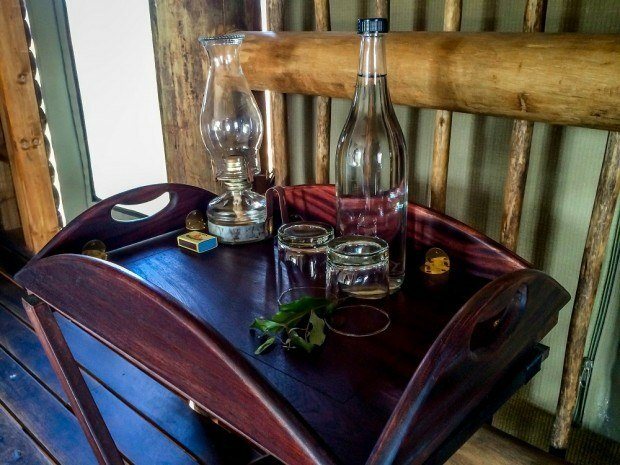 After a digestif, we would head back to our chalet, light the oil lamp which cast a soft glow around the room, and climb into the bed, which had been warming with a hot water bottle. While we tend to be night owls, we found we were tired and would soon drift off to sleep. 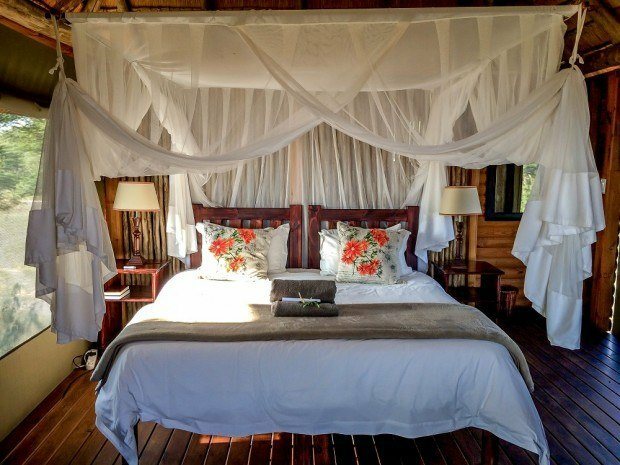 Back in the U.S., when we were planning our South African safari, we really didn’t know what to expect with luxury “treehouse” accommodations in Africa. While nThambo is not “in” trees, it is elevated on platforms “among” trees. The views from our nThambo chalet were our favorite from the entire trip. The nThambo Tree Camp provides the utmost in eco-friendly luxury in the heart of the greater Kruger National Park. 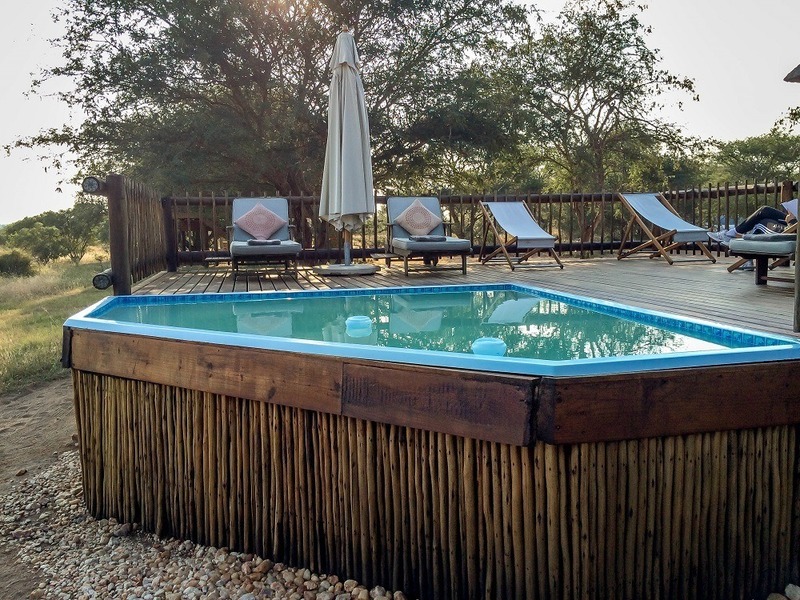 With only 5 chalets and a maximum of 10 adult guests, tranquility and relaxation are guaranteed. 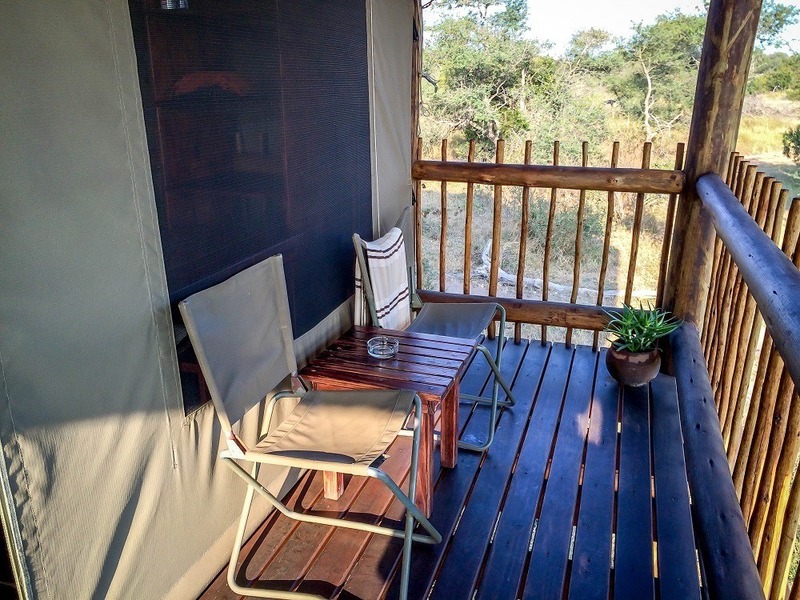 We cannot wait to come back to the nThambo Tree Camp! 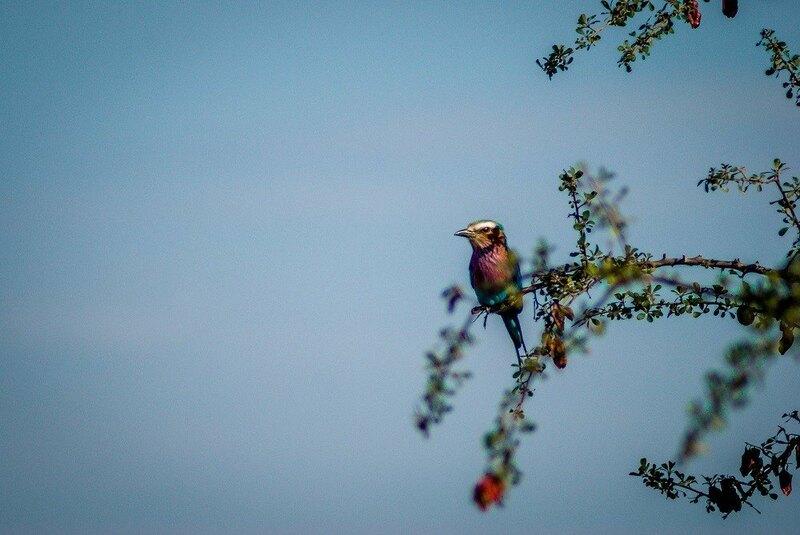 A special thanks to our hosts at the nThambo Tree Camp. As always, all opinions are our own. 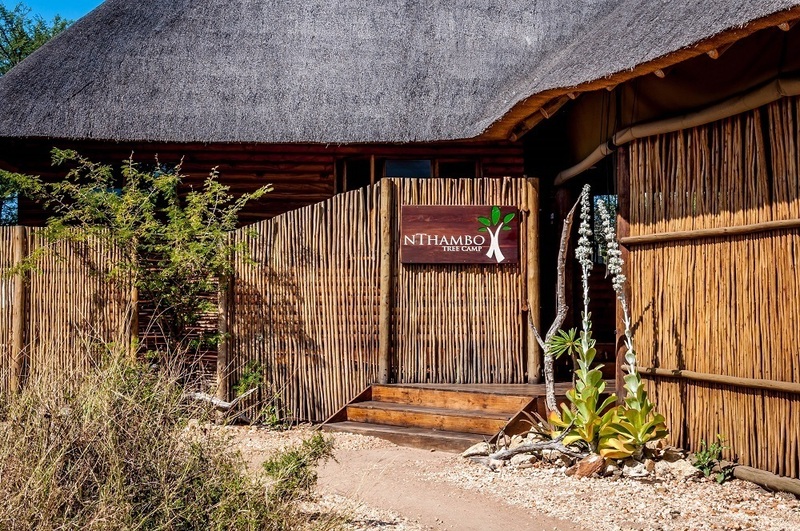 What do you think about Enjoying the Eco-Friendly nThambo Tree Camp? This is so gorgeous! It’s on my “bucket list” – as much as I don’t like that term – to go on a safari of sorts and stay at accommodations like this. It’s so expensive for me to head over there as a Canadian and stay but I suspect well worth it when I read posts like this. We had the time of our lives — on safari and at nThambo. Hoping very much that we can go back someday. Thanks Ray. Evidently the honey badger still makes appearances, although didn’t during our trip to nThambo. Not even so much as a seat cushion out of place.